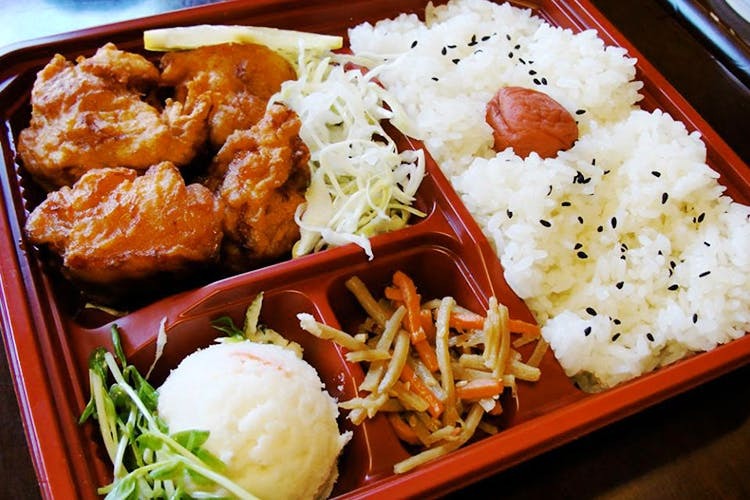 When office lunches get boring or you’re looking for a wholesome but exciting meal at home, order in Izu’s Bento Box. Inside Izu’s Bento Box, you get a single, generous portion of rice, meat, pickle and vegetables cooked in some heavenly gravy, with sides like a slice of cold omelette or miso soup. We love their delivery packaging – the boxes are packed neat and tight so there’s no transfer or spills. There are plenty of options in the bento department, which makes us super happy! Teriyaki Chicken Bento is an all-time favourite but the Pork Katsu Bento is slowly taking over. Also, by far one of the best miso soups out there, this is a must-have when you order from Izu! Often times people consider miso soup to be insipid or bland, but Izu will definitely get you to change your opinion. Change things up a little and put away your dabbas – instead, go for some good quality, nutritious Japanese food by ordering in Izu’s Bento Box. Get some of their sushi along with your bento order to make your meal a quintessential Japanese experience.